The prevalence of female instrumentalists distinguishes much of the music performance of Niger from that of other West African nations. Among the Tuareg, whose heartland is in Niger, girls are encouraged to study literature and music. They routinely accompany their singing and poetry with the imzad one-stringed fiddle or the tende drum, constructed before performances using a cooking mortar and goatskin. Similarly the njarka one-stringed fiddle is popular among Songhai woman. Tuareg men play the tahardent lute (the left instrument in the photo below), the alguarita oboe and the tisinsec and tazammart flutes. The Hausa and Djerma, two other important ethnic groups of Niger, play instruments similar to those of the Tuareg. 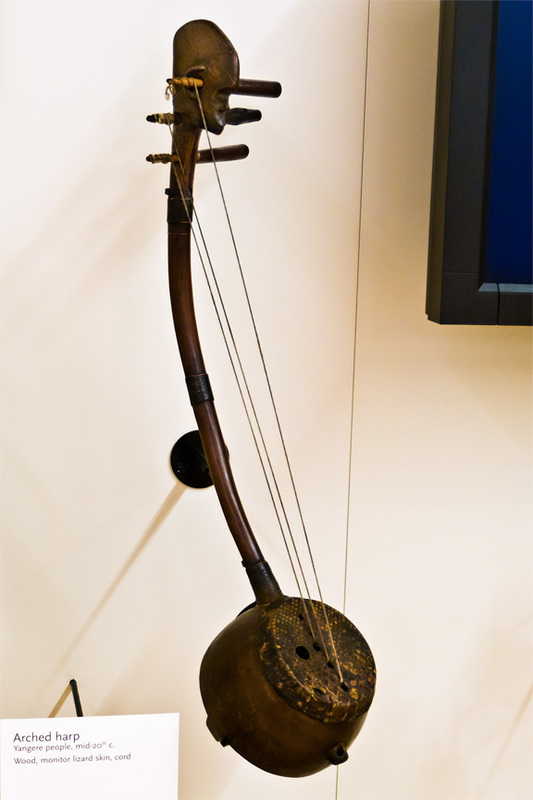 The Hausa play the sarewa (much like Tuareg flutes), and both the Hausa and the Djerma play the molo lute (the other instrument in the photo) and the goge one-string fiddle. The Republic of the Congo shares much music and culture with its neighbor, the Democratic Republic of the Congo. The dominant culture is that of the Congo people, who reside in the south and commonly play bells and trumpets, such as the nimbi and the pungi, respectively. 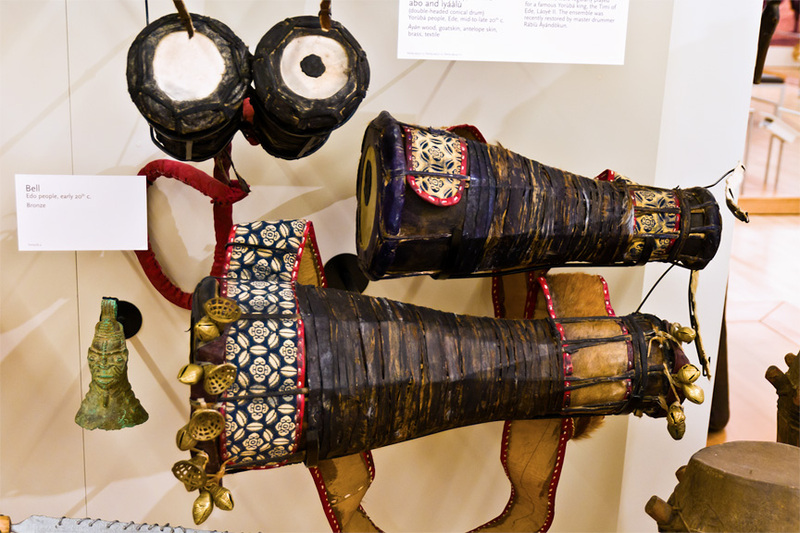 Trumpets frequently represent the ancestors, while friction drums signal royalty. Although many ethnic groups live in the Central African Republic, they share similar kinds of instruments such as the ngombi arched harp, lamellaphones, trumpets and skinned and slit drums. 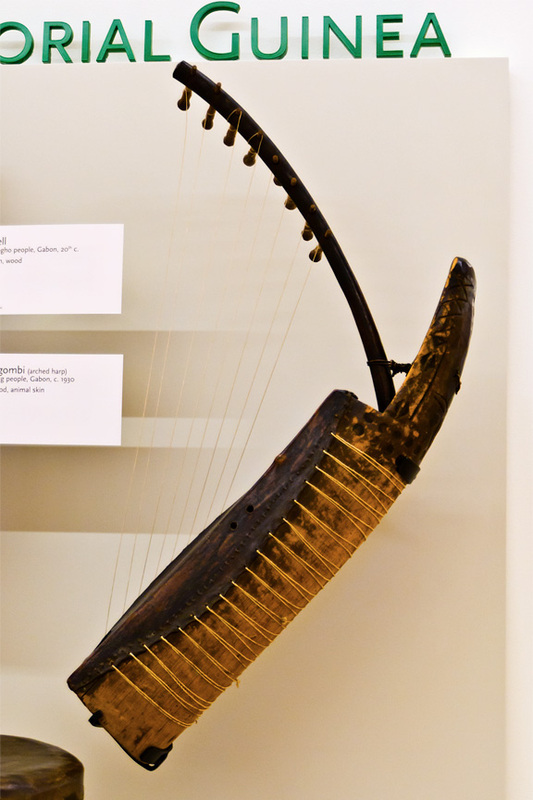 The arched harp in the photo to the right is made of wood, monitor lizard skin and cord. Gabon and Equatorial Guinea are known far and wide for the spectacular arched harps and carved drums. One of the dominant peoples in the region is the Fang, represented here by a stunning ngombi arched harp. 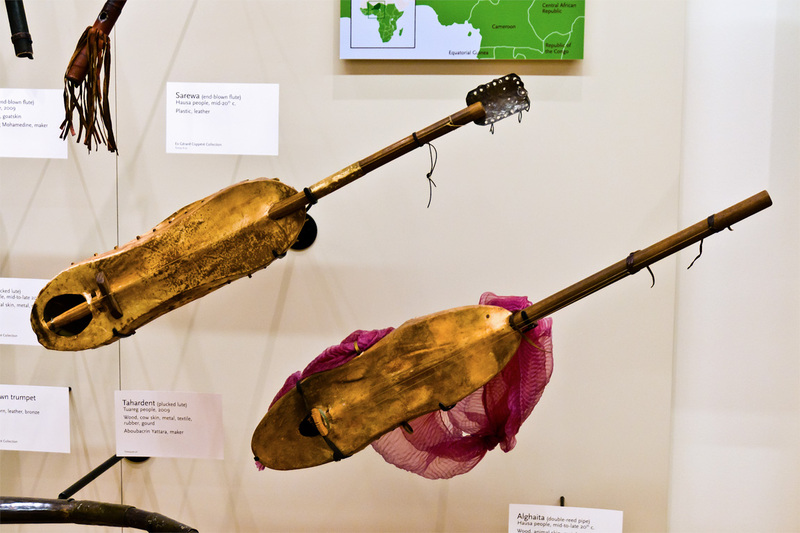 These instruments are central to the Fang and Mitsogho spiritual tradition called Bwete, or Bwiti. Shaped like a human figure, ngombi harps often have a carved head at the top of the neck. 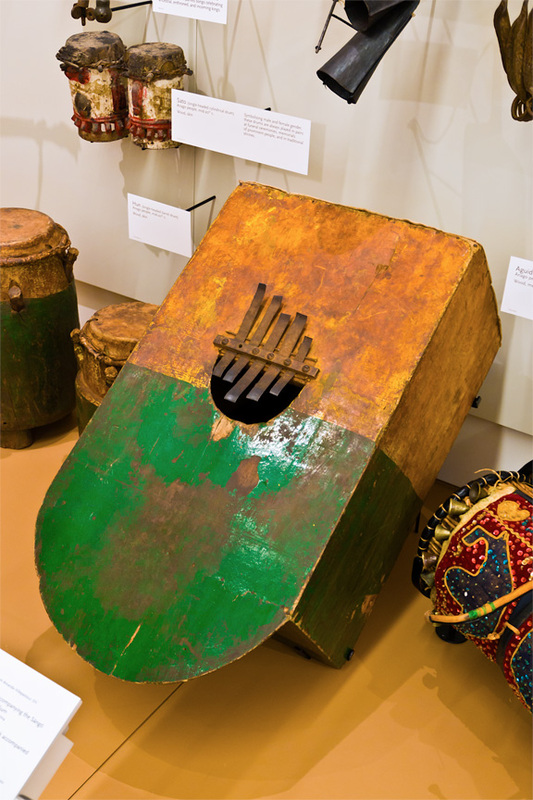 The resonator represents womanhood, while the instrument itself represents male mythical figures such as Disumba and Nzambe-Kana, the first ancestors of the Mitsogho. A "mini Africa", Cameroon has sharply contrasting cultures, languages and music traditions within a small space. 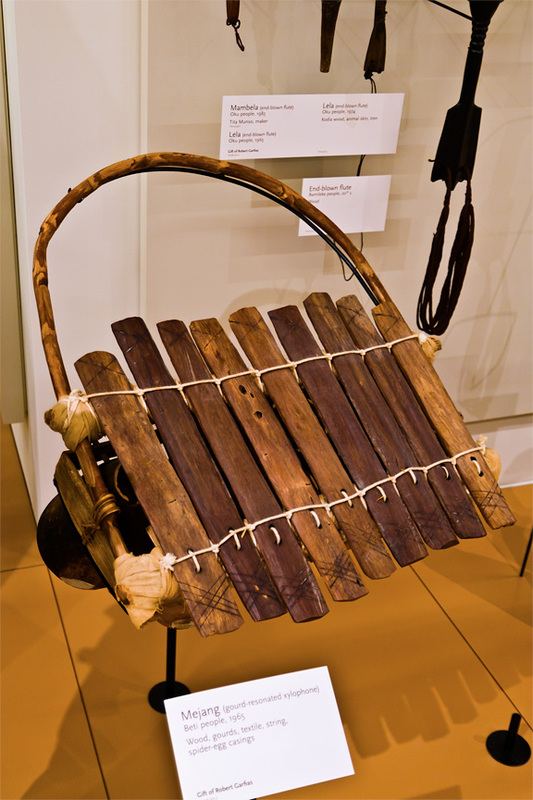 The southwest is home to Bulu, Beti and Fang people, whose common instruments include the mvet stick zither and the Beti menjang gourd-resonated xylophone (shown here), which accompany traveling chiefs. Southeastern forest dwellers are known for multipart singing but also play a range of drums and harps. Through the trans-Atlantic slave trade, the musical and spiritual traditions of the Yoruba people in Nigeria's southwest have taken root around the world. 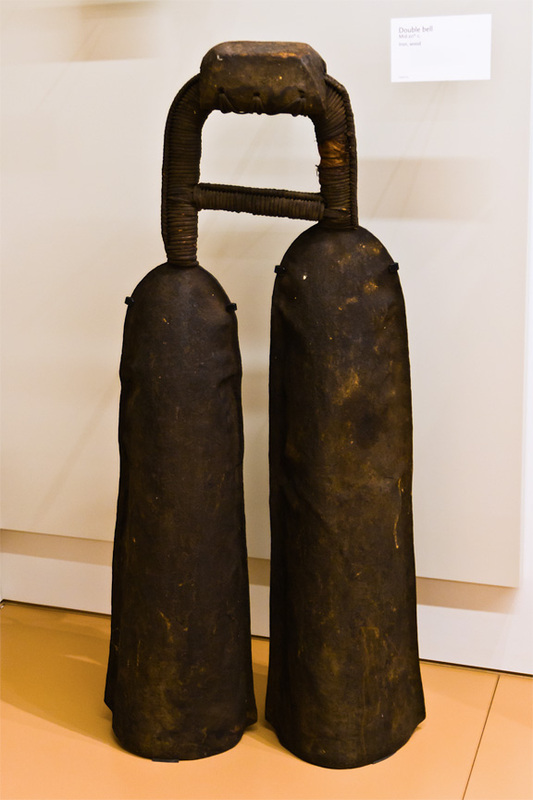 Yoruba bata drums (such as those shown here) encode human speech and are played to honor the deified 15th-century King Sango, also celebrated in ceremonies in Cuba, Brazil and beyond. Although a relatively small country, Benin has a population that includes several major ethnic groups, each with a rich cultural and musical tradition. It is one of the few African nation-states that officially recognizes local spiritual traditions, including vodum (the main origin for religions of similar name found among the African Diaspora in the New World such as Haitian Vodou, the Vudu of Puerto Rico and the Dominican Republic, Candomblé Jejé in Brazil (which uses the term Vodum), Louisiana Voodoo and Santería in Cuba. All these are syncretized with Christianity and the traditional religions of the Kongo people of Congo and Angola). The various ethnic groups influence one another's music. The Fon aguidigbo lamellaphone (pictured here) celebrates the deity Hevioso. The sato drums follow in the same tradition. I found the construction of this drum to be quite unusual — having more in common with a barrel than most drums — notice the stave and hoop construction. The landlocked nation of Burkina Faso sits at the nexus of the Volta, Mande and Sahel regions. The Volta Lobi people are well-known for their virtuosic xylophone traditions. 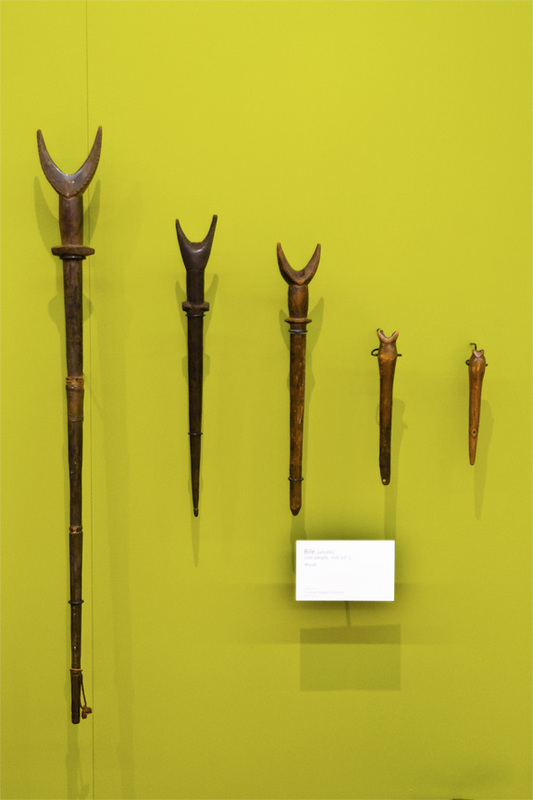 They are also known for bile whistles (shown here), which imitate the human voice and are used in funeral and fertility rituals, fighting competitions, hunting and war. The kora harp-lute (shown here) and ngoni lute are central instruments of Maninka jeliw musicians born into a professional lineage. 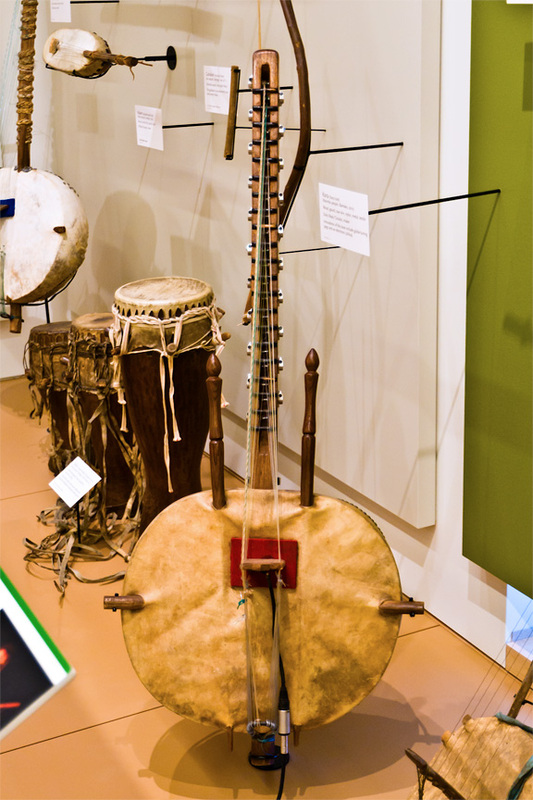 This is a modern version of the kora made of wood, gourd, cow skin, nylon, metal and textile but including modern guitar-tuning pegs and an electronic pickup. 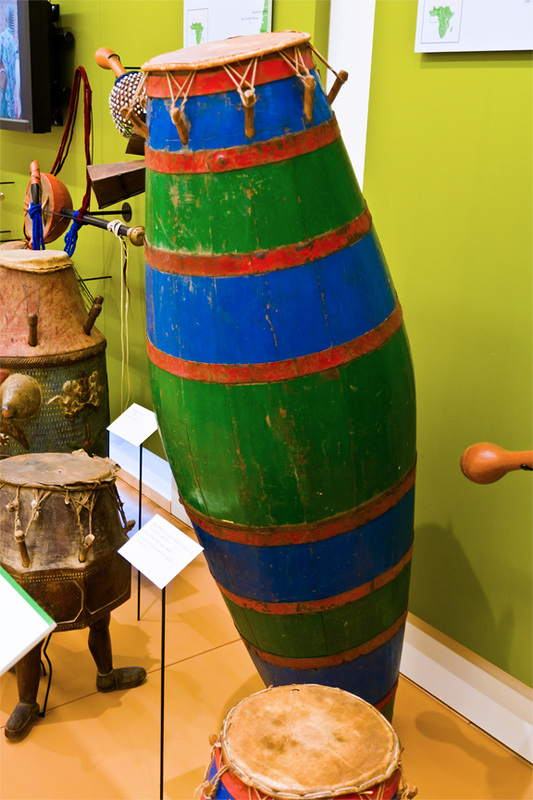 Senegal and Gambia are most known for strong percussion traditions. 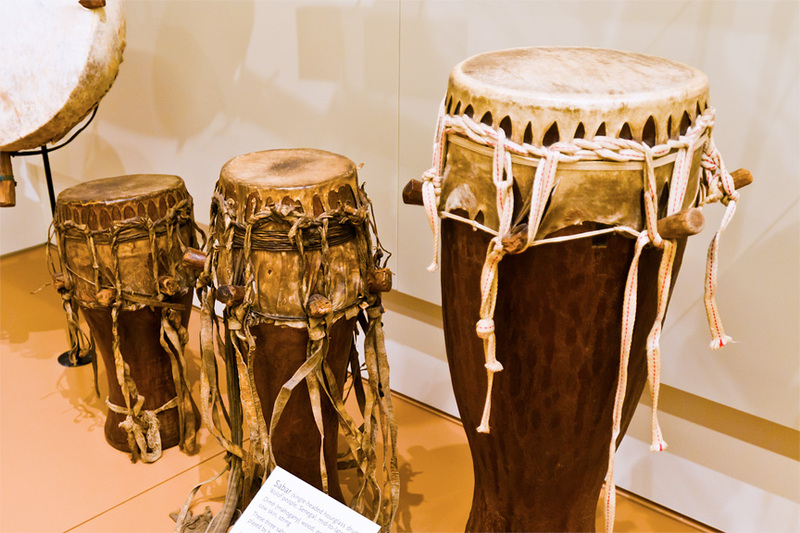 The fast style of Wolof sabar drumming has influenced percussion and dance among the neighboring Jala and Mandinka peoples. The music of Cape Verde, a archipelago off the West African coast, reflects the country's mixed African and Portuguese heritage. First inhabited by Portuguese colonizers and West African slaves, Cape Verde is characterized by a creole culture and music. 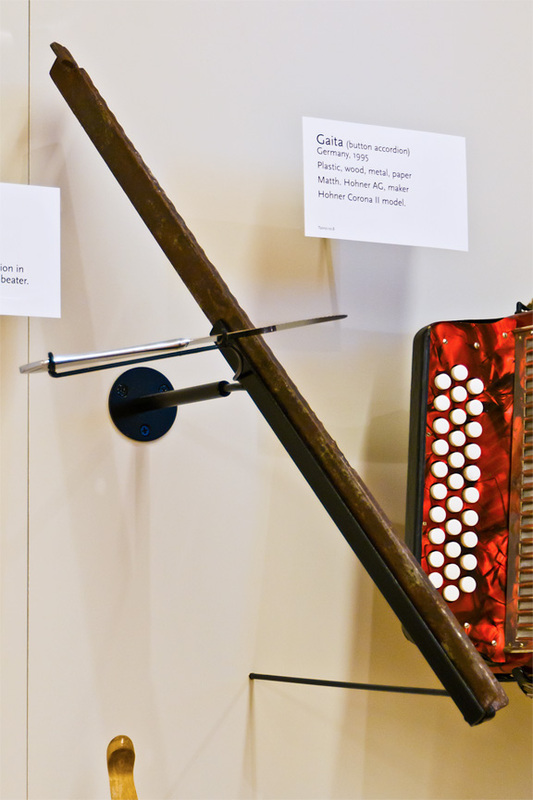 The funana genre has strong African roots, and is played by men on the gaito accordion and ferrinho iron scraper (shown here). Guinea and Guinea-Bissau share tropical coastlines and drier savannah interiors, and their musical traditions reflect such geographic diversity. These various regional traditions have been brought together by groups such as Les Ballets Africains to represent each country's national identify. 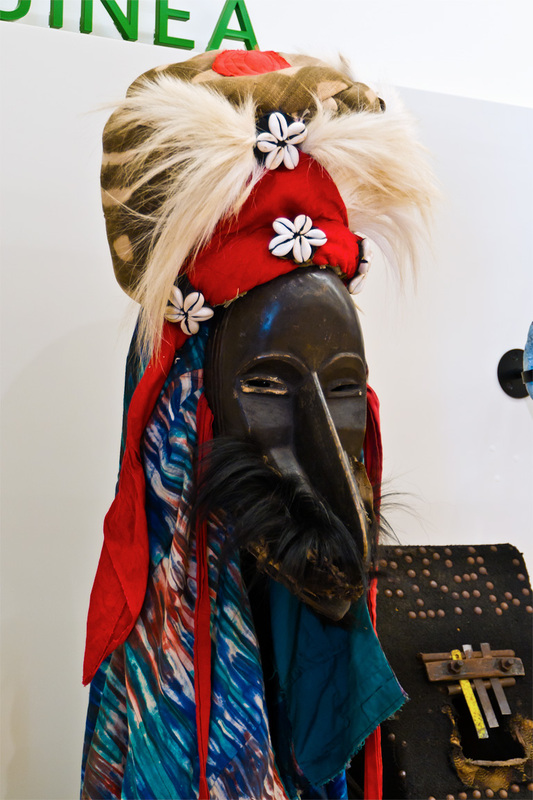 More than the musical instruments, I was taken by this elaborate mask fabricated for the ballet.